We’re doing all we can nationally to advocate for these issues. But we cannot do it alone. We need your help to deliver our message to your local parliamentary candidates and get them to commit to our asks. As an FPH member, you are well-placed to do this because Parliamentary candidates are much more likely to listen to the concerns of their constituents- especially when those concerns are presented against the backdrop of local data or case-studies- than they are to national organisations with no concrete links to their community. Over the next week or so, candidates will be in a mad dash to meet as many of their constituents as they can. What they hear on your doorstep or at a hustings in your community may follow them into the House of Commons. To help you get started, we produced this brief one page guide outlining how you can campaign on behalf of FPH. It includes sample questions to ask, opportunities to take advantage of, and tips for building relationships with your candidates. Make sure you also visit our General Election webpage to access all of our resources (including our Start Well, Live Better manifesto) to help you campaign and to see the election ‘asks’ from our allied organisations and partners. Finally, we want to hear from you! Your feedback is invaluable to us. If you do speak to any of your candidates, we would love to hear how it went. Or, if you need help in reaching out to them, please feel free to email FPH’s policy team (policy@fph.org.uk) for some advice and guidance. We want to help as many members as possible build and maintain relationships with their candidates, both in the run up to election and, crucially, with the next government. Thank you for your continued support. This blog is part of a series of posts to promote discussion and debate around the priorities in Start Well, Live Better: FPH’s manifesto for the 2015 General Election. Our behaviour is more influenced by our surroundings than we think. Our behaviours are a function of what surrounds us – physically, socially and culturally, We are shaped by norms more than we shape them. Consequently, when an influential group of people have the chance to re-set norms in visible and newsworthy ways, where results benefit almost everyone both immediately and long term, why wouldn’t we seize the opportunity? Well, health professionals and health organisations now have such a chance. The case for divesting from fossil fuel is now very strong. The British Medical Association (BMA) is committed to this journey and since its 2014 Annual Representatives Meeting (ARM) is actively investigating how best to send out a powerful message on health and social justice. This very welcome move will hopefully start a trickle and then a tidal wave of divestment from the fossil fuel industry which, like the tobacco world, has spent outrageous sums of money on sowing doubt about the harmful effects of a high carbon world and the beneficial health and equity effects of a low carbon society. Read Oreskes book: Merchants of Doubt. In retrospect, the data now strongly suggest that the fall in smoking levels amongst many groups did not really happen until health professionals (particularly doctors) stopped smoking. We all have bizarre habits where our creative energy is used more to justify them than to address them. If we struggle to justify our smoking habit to our peers or to ourselves, where better to reassure one’s self than by pointing to a health professional smoking. Change does happen though, often quickly, although rarely planned (witness the banning of smoking on the London Underground). Such changes are often not driven primarily by the law (smoking on planes and overground trains). 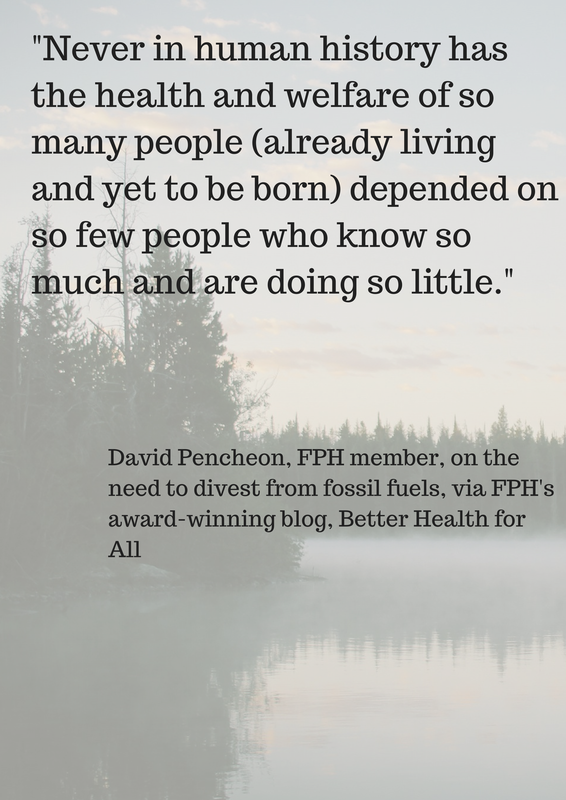 If health professionals and organisations simply all say: no, we do not invest any assets we have supporting an industry which knowingly perpetuates an addiction (to fossil fuel) and does not actively attempt to address this threat in the radical ways needed. Fossil fuel companies need to understand that their so called wealth is largely based on resources still in the ground – which the incontrovertible evidence (supported by the UN, the World Bank; The Pentagon, the UK Ministry of Defence, and the CIA) says needs to be left there. City investors are already having doubts about the real worth of some fossil fuel companies if their so-called assets are theoretical. We have a duty and responsibility to help shape the future as much as we are shaped by it. The great mystery to historians at the end of the 21st century (if there is anyone left to write our history) any of us left) is why, at the beginning of the century, we did so much talking and research on what is happening and took so little action. Never in human history has the health and welfare of so many people (already living and yet to be born) depended on so few people who know so much and are doing so little. Do something good today and write a letter to the President, CEO, Chair and Treasurer of the BMA and congratulate them for at least actively and publicly committing themselves to this journey. And ask your own organisation how much is invested in the fossil fuel industry. These are not easy questions. What constitutes a fossil fuel company? Are any savings I have ethically invested? But they are not impossible. We must not let perfection be the enemy of pragmatism and we must start today not tomorrow. This is all happening on our watch and will be our legacy. When our great grandchildren say to us: what did you do at the beginning of the century, let us all try and do more than just mumble we that we knowingly and passively conspired with circumstance. Health professionals, rightly or wrongly, are still well respected, are numerous and interact with all members of society every day and in every community in the land. Numbers matter: one person is a crackpot, two is a pressure group, and three is a social and political movement. If health professionals don’t draw a line in the sand, then who will? And if we don’t do it now, then when will we do it? 1. Oreskes and Conway: Merchants of Doubt: How a Handful of Scientists Obscured the Truth on Issues from Tobacco Smoke to Global Warming. 2013. A version of this blog was first published on the BMJ website.